General Nathaniel Lyon was born July 14, 1818 in Ashford, Connecticut. He was killed at the Battle of Wilson's Creek on August 10, 1861. He was the Union's first General to die on the field of battle during the Civil War. Young Mr. Lyon spent his childhood working on the family farm. Securing entrance to West Point, he began his military training on July 1, 1837 and graduated 11th in his class of 52 on June 22, 1841. Upon graduation he chose the infantry for the prospect of more rapid promotion. Lyon was promoted to the rank of 2nd Lieutenant on July 1, 1841 and was assigned to Co. I, 2nd U.S. Infantry at Fort Russell in Florida to be engaged in actions against the Seminole Indians. By the time he reported for duty, the Indians had all but given up. The unit was transferred to Madison Barracks on Lake Ontario in New York. In October of 1846, Lyon and his company joined the rest of the 2nd Infantry and proceeded to the Rio Grande to join in the coming war with Mexico. On April 16, 1847, he received his promotion to 1st. Lieutenant and was given command of Co. D, 2nd Infantry. On September 14, 1847 Lyon with his troops entered Mexico City. They had been told that Santa Anna had vacated the city, but when the troops marched in, they were fired on from almost every roof top. 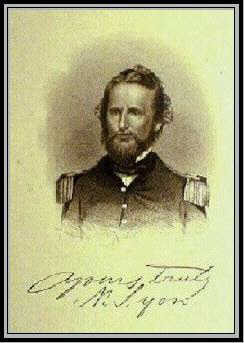 After securing the city, Lyon was ordered to New Orleans, and on September 18, 1847 Lyon received his promotion to Brevet Captain. In February of 1861, Lyon and his company were assigned to bolster the weak defenses of the St. Louis Arsenal in Missouri. The St. Louis Arsenal contained 60,000 muskets, 90,000 pounds of powder, 1 ½ million ball cartridges, 40 field pieces and the machinery for manufacture of arms. Also located downtown was the Federal Sub-Treasury which housed over a million dollars in gold and silver. These facilities were both severely under guarded. Lyon was ordered to fortify the compounds. Lyon armed 2,500 volunteers loyal to the Union and inducted them into Federal service as per his instructions from Washington. By general consensus, the Missouri Volunteers elected Lyon General of their regiment. On May 10, 1861 General Lyon gathered his command of about 7,000 men and started on a six mile journey toward Camp Jackson, a Confederate camp, arriving from several directions and surrounding the camp. Lyon demanded the camp's unconditional surrender, which he received. For the next month the City of St. Louis was on the edge of chaos with violence erupting sporadically. General stayed in Boontown refitting and re-supplying his command until July 3, 1861. Hearing of a large Rebel Force moving against him, on August 1 Lyon moved to intercept them. His men moved into position undetected on the night of August 9 and surprised the Confederates in the morning. General Lyon was directing troops on foot leading his horse. He was struck in the leg and his horse was killed in a hail of bullets. Later General Lyon was struck again, this time he was grazed on the right side of his head. He staggered to the rear with the aid of another officer. Lyon reformed for a second assault and decided to lead it himself. 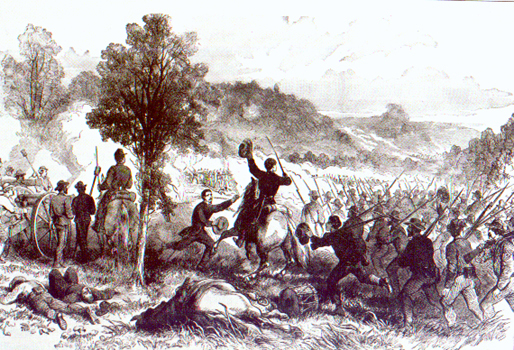 Taking a mount from an aid, he lead the 2nd Kansas to the fight. Lyon was hit in the chest from only a few yards and fell from his horse and died. Major Sturgis then took command. The Confederates under General Price mounted one final grand assault upon "Bloody Hill" only to be repulsed for the third time. When the Confederates fell back to regroup, Major Sturgis ordered a hasty retreat to Springfield. The exhausted Confederates ordered no pursuit and the Battle of Wilson's Creek had ended. The Battle of Wilson's Creek was bloodier than anyone had imagined. In six hours of fighting the Federals had suffered 1,317 killed, wounded and missing. The Confederate lost 1,230. News of General Lyon's death and the Battle of Wilson's Creek spread across the country. Flags flew at half mast as the funeral train stopped in Cincinnati, Philadelphia, New York and Hartford. General Lyon was buried September 5, 1861 in the family plot in Phoenixville, Connecticut. For his actions General Lyon has since been known as the "Savior of Missouri."